Staying in Marrakesh for a few days, or even longer, allows you to rediscover a certain serenity and to recharge your batteries. It is the perfect place to forget the stress of everyday life and have a relaxing break where you can really focus on your well-being. Located in an ideal spot just a few hours from major European cities and easy to get to from the major Moroccan cities, the Ochre City welcomes travellers from all around the world who are looking for an authentic place to top up on good energy. Staying in Marrakesh allows you to benefit from a well-deserved break and take the time to make the most of lots of this imperial city’s hidden gems. Marrakesh is a city like no other. It has so many different sides of it to offer to its visitors, meaning there really is something for everyone. All five of the travellers’ senses will be tickled when they stroll through the Jemaa El Fna Square or set off to discover all the little alleyways that make up the souk district. It is a real window into Moroccan culture, local crafts and the locals’ sunny disposition. Do you need a moment to relax and focus on your well-being after the hustle and bustle of the square? 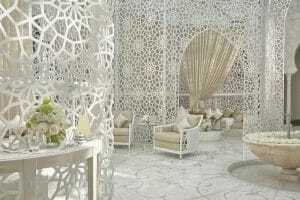 Take the time to pamper yourself by stopping off at the intimate world of the Royal Mansour Marrakech spa. It is a place where serenity reigns over everything. These moments will feel timeless and allow you to soak up all the energy you need to go back to your everyday life. Gastronomy lovers will love discovering the richness of Moroccan cuisine, and there is much more to it than the traditional couscous or tajines. It is really varied and holds an important place in world gastronomy. Marrakesh is also a city with a rich history, which is clear from the various monuments that you can visit. When you go and see them, you will realise just how beautiful and subtle Moroccan architecture is. Art also plays a significant role in the city, as can be seen from its many galleries. There you will discover the work of contemporary artists who give a fresh lease of life to Marrakesh’s creative activity. A trip to Marrakesh is a bit like a trip beyond time. Decorations that are fit for One Thousand and One Nights await you and will transport you far away from all your everyday worries. There is no one way to visit Marrakesh but loads of different ways, as this imperial city has a rich culture, craftsmanship, gastronomy, society, etc. The Royal Mansour Marrakech is on hand to organise thematic or unusual trips in the city, depending on what you are interested in. Go and discover a quirky and exclusive side of Marrakesh with our team’s advice.